“I could have done better”. This may be your one of your misgivings after taking the ACT. You might be wondering why you got a low score. In this case, you may have done something wrong. It’s not that you’re a bad test taker, but there might be lapses in your test prep or attitude. What are the things that ACT test takers do wrong? Chances are, your ACT score will be in the best of shape if you have thoroughly and accurately prepared for your test. And most especially if you have a strong teacher guiding you well. Note that if you’ve had an appropriate test prep program, it is unlikely that there would be lurking problems that would crop up as you take your ACT. Here’s a story of two students who plan to take the ACT. They both are taking time to go through a meticulous test prep. There’s student A who takes his ACT practice tests every Saturday afternoons. He gets a full night sleep before doing so. Student A assumes with his ACT prep after exercising and relaxing in his quiet room. Whenever student A finishes prepping for a single section, he goes to the kitchen to reward himself with a hefty snack, texts his BFF or watch an episode on Netflix. In the evening, after student A accomplishes his practice test, he scores a 35. Confident that this is a precise reflection of his skills, he hopes to achieve the same score in the real ACT. Then there’s student B who schedules to take his practice tests every Saturday morning at 8 AM. He wakes up early in the morning and takes a trip to the Starbucks shop near his house. The place is really noisy and he usually ends up tired after finishing the first section of his practice test. Because of the distraction, student B hurries to complete his practice exam. He doesn’t stop for a break nor halts his timer. Student B nonetheless finishes his test at the designated time and scores a 35. Something that he hopes to happen after taking the ACT. Now, who’s more likely to succeed in their coming academic undertaking? It’s student B who has become familiar with the real conditions of taking the ACT. He is more likely to be focused when taking the test with so many people and have acclimatized to the garrulous situation of this feat. Student A will tend to be tired, rushed and distracted which is likely to affect his score. The moral of the story is that you have to familiarize yourself with the real test-taking situation during your test prep. Unlike what your teachers instruct in school, there are different and optional ways to solve problems. For instance, solving an Algebraic problem requires you to utilize one Algebraic method that they teach. In the ACT, you can apply different ways to solve a Math problem. You can choose a complicated method, or an easy and error-proof way. Divergent methods to solve test problems are typically taught by credible and expert tutors or website. To illustrate, a student may come face to face with a wall and climb, scratch, jump and construct a ladder to get to the other side. What a test prep professional will do is to show a door that will help them go through the wall and arrive at the other side. You have to be aware of the time when tackling every item and section of the ACT. Don’t spend too much time on a question, especially if you exceed your time limit. In the Math portion, for example, you have to complete answering 60 questions in 60 minutes, and this means you can only allocate 1 minute for every question. If, within that time limit, you still can’t work out the item, proceed on to the next. The timing of the ACT can be so fast, causing test-takers to panic. You can overcome this tendency by taking practice tests which studies have shown to be an effective method to beat test anxiety. It is also advisable to wear a watch, but only that which is approved by the College Board. It’ll save you time, particularly because you don’t have to look up at the clock inside your testing center. 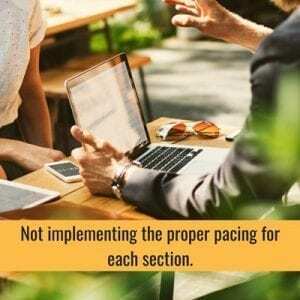 Before you take the ACT, be sure to know proper pacing by taking practice tests. These are the 4 things that ACT test takers do wrong. Now that you’re in-the-know, you can take the necessary steps to avoid them and achieve the best score possible in your ACT. Limited Time: Get Your FREE ACT Study Guide Ebook & Much More! Sign Up!